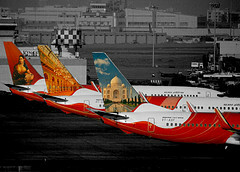 Airliners-India :: View topic - Your future flights..
We look forward to a laugh-fest for us, with another witty trip report from you. It will be nice to see how well AF pull up their socks after the backlash they have (deservedly, IMHO) got. Exams are done so do expect a bit of activity from me in a certain part of this forum. Anyways, I'd like to share a bit of pain with you all. 6E246 CCU DEL 1135 1400 A320 one of these days. Personally, I'd go for Dad's itinerary. That is for various reasons. -I've been to CCU so many times. Hyderabad was last in 2005. -A certain aviation company 'Bias' which I have. That has more flights in this set. Oh and they have 3 more flights together with your's truly. As I have already mentioned about charity work in the 9W thread.. An announcement is still imminent. A bit more of a wait, that is all. Isn't a 3hr40min window enough, even if there is a delay? I already hinted at something on WhatsApp. Oh well, since the month is already here, I'd like to announce my next trip, although its a long long way to go. The inevitable will happen now, people. Lots I've heard about that airline. A few amazing stories, but sadly, most of them are on the negative side. And these are stories from recent times. I've somehow managed not to fly SriLankan Airlines in all my trips (via DXB to South Africa, the two Singapore trips, so many India trips...) but this duck will finally be broken, as airlines do not have flights to the destination, other than UL. And I think most of you (WhatsApp group members) must have forgotten because I mentioned it a long time ago. Its a trip to Bengaluru. Thanks to you readers' feedback on my last TR (the Jaffna one. Its been so long! ), I will focus on the food aspect too, although most of us know what food over there feels like. My next trip. Tentative dates, tickets not done yet. Prices will be skyhigh for departure on 05-Jan - other than that - have a safe trip! Office is paying for it. They have a policy where they don't book the tickets till one has the Visa. and thanks to the Christmas holidays, my passport is in the German consulate for over a week now. Can we expect a TR on this? Sure. If I am travelling by LH, I might have around 8 hours transit at FRA. I'll try and put it to good use and complete my TR. It's 744 and CRJ700. Both are a first for me. 8 hours between flights at FRA. Any suggestions what to do. I am planning to take the FRA airport tour. That would be even better for a separate TR of its own! Really look forward to it, Sir. As expected - full fare Y tickets - must have cost your org a bomb - would be cheaper to fly discounted economy fares . Hope you had a good flight! Yes it cost a bomb, but I had to be at client's office today. So in the end there was no other option. At least I will earn around 14K miles. I Cannot wait for tonight! FARES ARE SUBJECT TO CHANGES"
The EWR-LAX sector is already upgraded to B as Y/B fares are instant upgrade to business class on US domestic. Given the Platinum status I have this year - I will earn 25.8K status miles on this itinerary and 38.7K award miles! This is far better earning potential than SQ - which was 19.5K status and the same award miles. Long trip to the US this time , and to a new city as well (much prefer going to cities where I'm already familiar with things). Edited to update the outbound journey dates - got shifted by a week. Next trip coming up soon. 1May MCO-SFO (752) connecting to SFO-LAS (320) - late evening flight arriving LAS at 12:30 am. 20th May IAH-FRA-BLR (380/748) finally get the new queen on the way back. The things one has to do for work. I am expected to be here for a year at least. No point in booking a return ticket yet. One week is not enough for France. But then, the itinerary is Paris only, so I guess a week is enough for Paris only, but like you said - there is plenty of stuff in France as a whole.. Taking off again, this time to MEL, and permanently. I have been offered a place at the University of Melbourne, and so thus begins my next chapter in life. Hopefully, I'll get to do a TR about this! These dates are subject to my Australian visa application, so hopefully I get to fly out on these dates! The French ATC are going on strike from the 24th june for six days, and about 20 - 50% of long haul flights are expected to be affected. It should all go well . Don't get too worried. I saw the notice on the (annoying) CX website, and I did get a bit worried if I be honest. However, today UL563 reached CDG 11 minutes before time, while UL563 is pretty much on time. My trip to India this year is finally confirmed! Other flights will be BOM-HYD, HYD-BLR, and BLR-BOM, specifics TBD. ^^ Congratulations! What was the approx fare for this routing and did you want to land in BOM or was that taken due to the lack of convenient options to get you to HYD? The fare was approximately $1980. The direct option to HYD from DAB, which was DAB-CLT-LHR-HYD on US/AA/BA, was very expensive, over $3500! The good thing about this routing is that it gives me the opportunity to experience the new T2, and it also gives me the opportunity to experience the BOM domestic terminal, which I have not been through since 2000. ^^ Enjoy - and make sure you give yourself some time to acclimatize to the high altitude and low oxygen in Leh. If you are already asthmatic - be extra careful! Highlight: First B787 flight and first flight through T2 Mumbai. A short trip and three new birds.